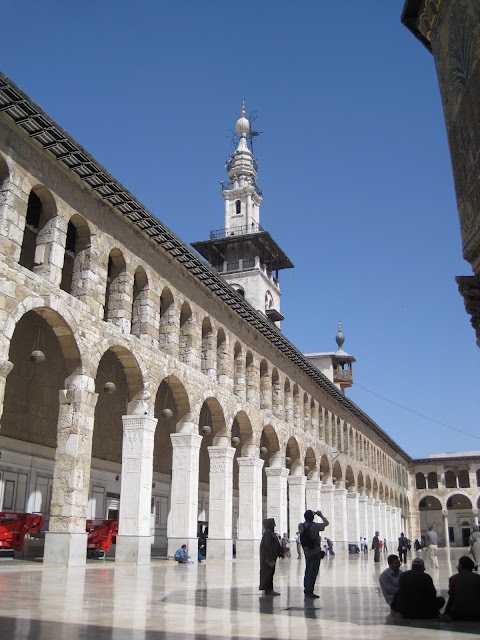 Damascus - The Oldest City in the World? Flying into Syria I felt a little nervous, though I knew it was ridiculous and that everything would be fine. It's impossible to prevent yourself from absorbing the "negative press", even when you should know better. This self conscious concern about how our attitudes are shaped is exactly why we felt the need to visit Syria. Witnessing a place first hand immunizes you against hyperbolic demonizing, distortions, and general misrepresentations. Your personal experience, and the people you meet, determines how you understand a place. We first learnt this lesson on a visit to Iran in 2003, when we saw a similar contrast between the headlines and our personal experience; neither destination seemed like an 'Axis of Evil". 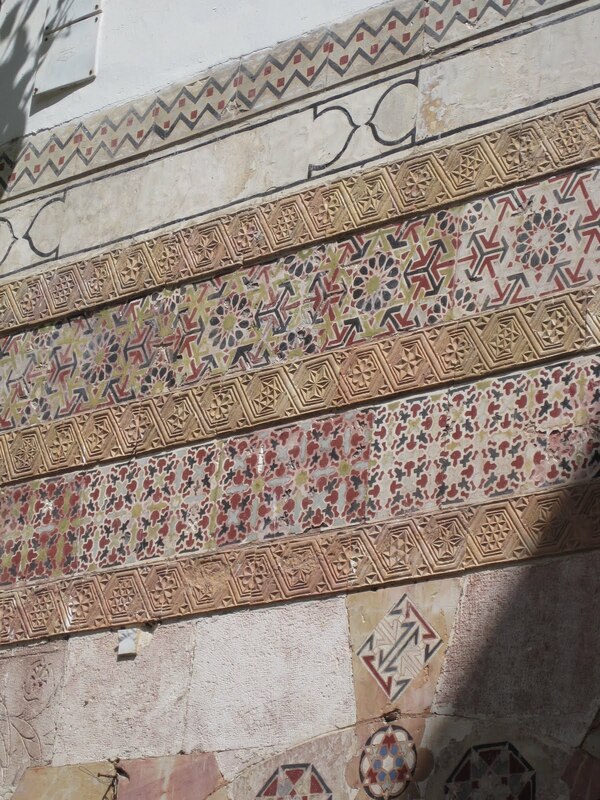 The Umayyad Mosque in Damascus is a very early example of Islamic architecture, and the decoration is quite different from the blue and white tile work we saw in Iran and Central Asia. 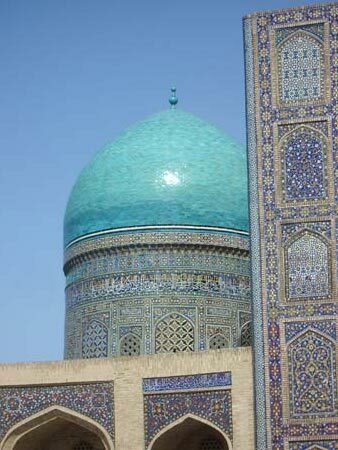 The mosque was built in an earlier period, and the style and mosaic decoration are more reminiscent of Byzantine art, that what we think of as a classically Islamic style. It's a lovely building and we felt welcomed. In contrast to Canterbury Cathedral, where visitor are asked for a "donation" on entry, we were invited in - though there was a small fee for the requisite chador. I love the sign for the "Special Clothes Room", see the photo below! Perhaps not looking my best in the "suitable outfit"! Foreigners were not the only ones requiring the "Special Clothes" - in Damascus and Aleppo we saw Syrian women borrow the more modest cover ups on entering the mosque. Damascus is said to be one of the oldest continuously occupied cities on earth. 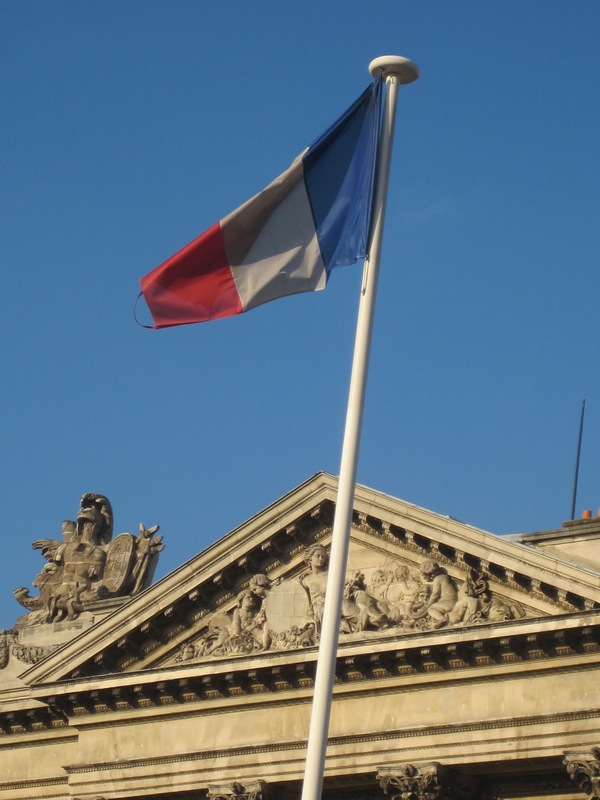 Certainly it is a rich repository of various cultures and histories. The Old City contains Christian, Muslim and Jewish quarters and more shops than one could imagine. 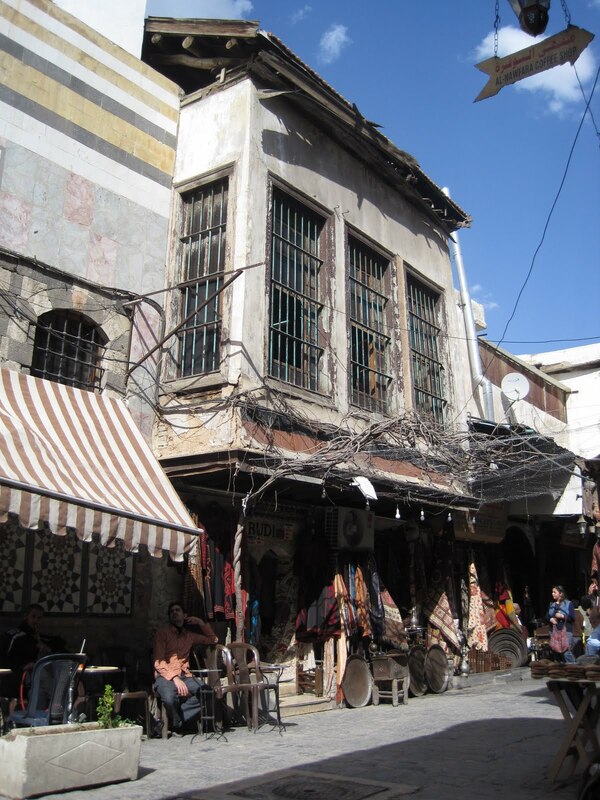 After our time in Damascus I began to think that every Syrian owns a small shop in one of the innumerable souks! We stayed just off Straight Street, almost exactly where the different quarters meet. 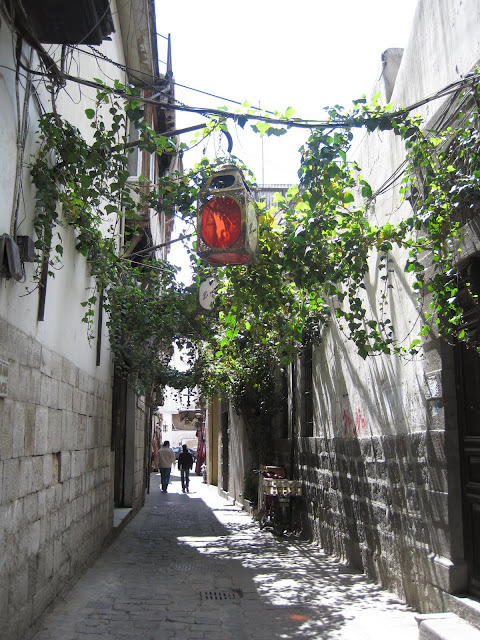 It was a wonderful location for the souks, the Umayyad mosque, as well as the churches and the nightlife of the Christian Quarter. We enjoyed our hotel Beit Akbik, which I reviewed here. The large Azem Palace is built in the Ottoman style and was reminiscent of buildings we've seen in Morocco. It was lovely, with numerous courtyards opening into each other. 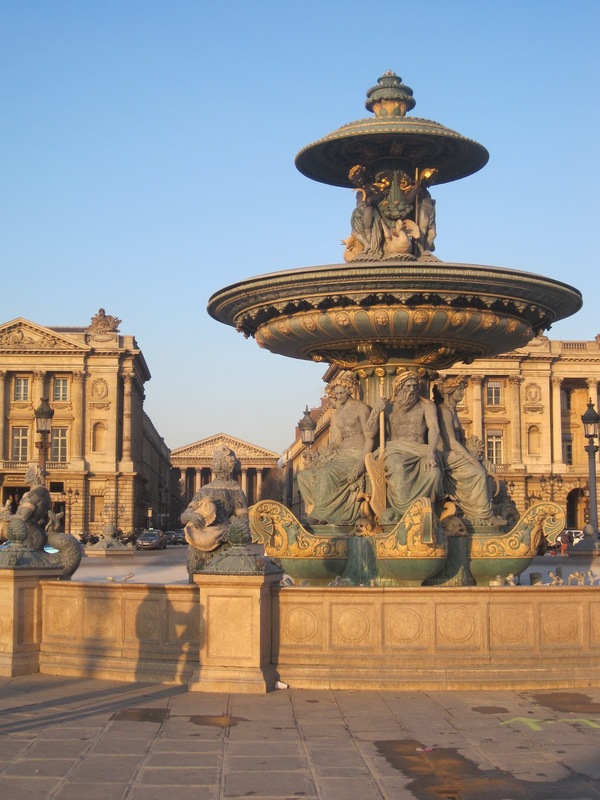 It's an incredibly lavish building with a private hamman and multiple fountains. The rooms are decorated with inlayed wood and marble, and many have beautifully carved and decorated wooden ceilings. It evokes the feeling of the exotic, the harem, Aladdin and One Hundred and One Nights. 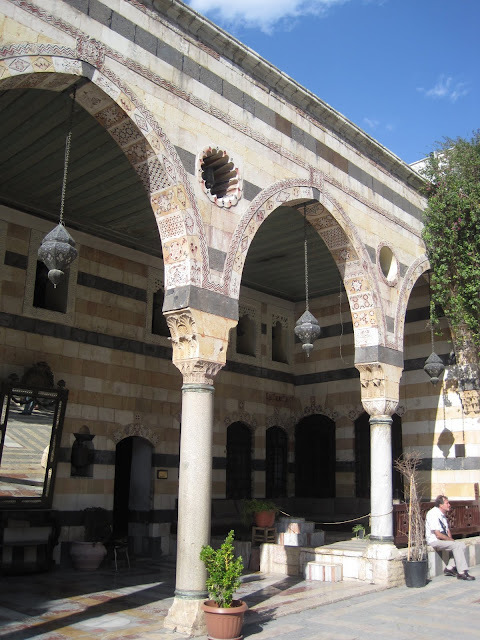 The large courtyards are an great respite from the energy and noise of the surrounding souk. The Old City is a wonderful place to walk because so many of the small streets are too narrow for cars. We spent four nights in Damascus and we took our time to wander. We saw a number of European tour groups, individual travelers, and larger Christian groups visiting a variety of sites relating to St. Paul. 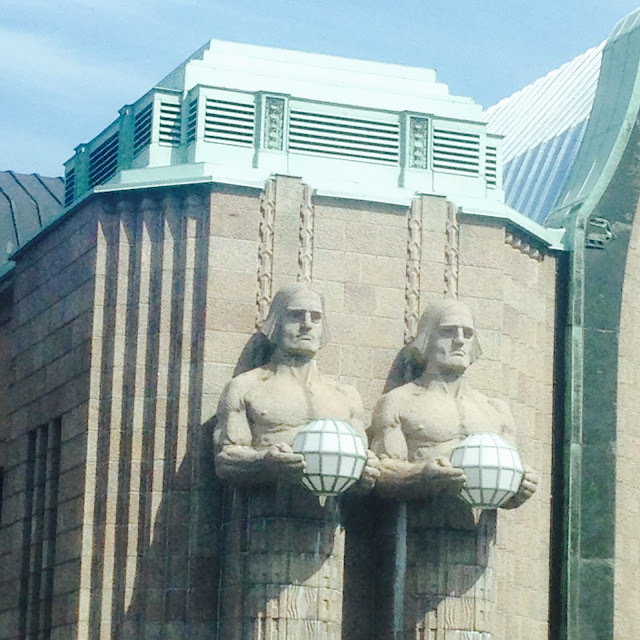 There was so much we didn't see, the National Museum included. 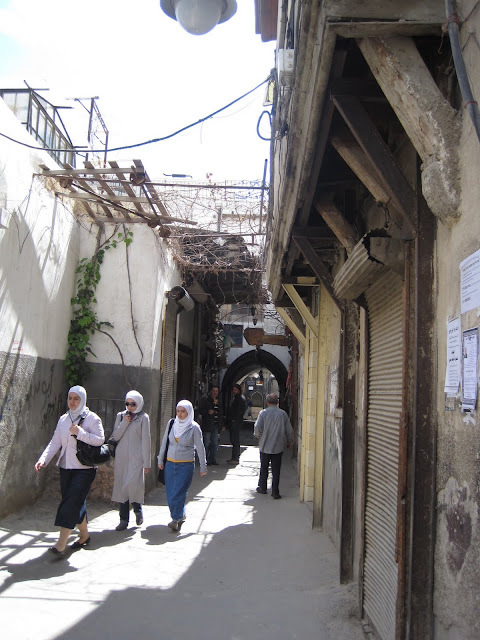 We spent most of our time in the Old City, but left it for a walk suggested in the Lonely Planet, in the neighborhood of Salihiyah. 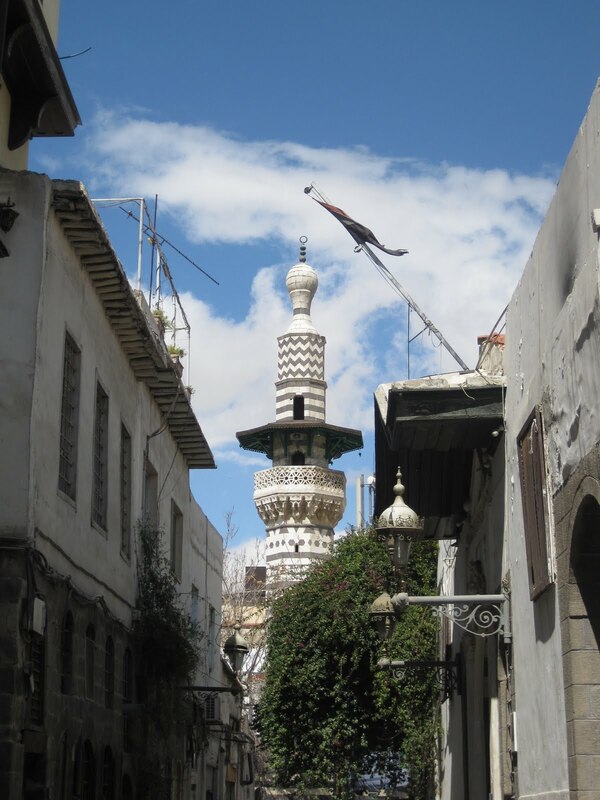 It's an interesting quarter with many historic mosques, madrassas, and old tombs scattered through the neighborhood which stretches up the hill overlooking the city. In amongst the souks and older buildings are apartment buildings built during the French Mandate, with clear Art Deco and Modernist styling. 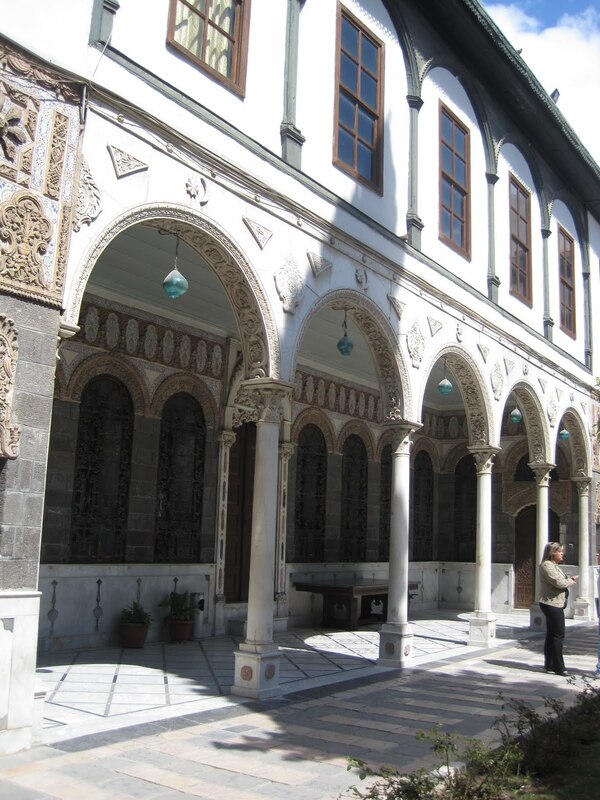 While exploring the Old City, we tried to visit several historic Damascene houses which were listed in our guidebooks. Unfortunately, all three were closed and undergoing extensive renovations to transform them into hotels, including one which will be opening as part of the Serena group. We were lucky enough to meet the manager of the Serena group in Syria, and a representative of the Aga Khan Foundation which is funding some of the restoration work. We had a fascinating discussion about the architectural work they are doing and the ethics of public vs. private architectural restoration. It's great to see the quality work that they're doing, but when buildings that were open to the public are turned into exclusive hotels it raises a lot of questions about who the restoration serves? I'm afraid that in the future there'll be only nominal public access for locals, though of course there'll be more jobs serving wealthy foriegners in the tourism sector. 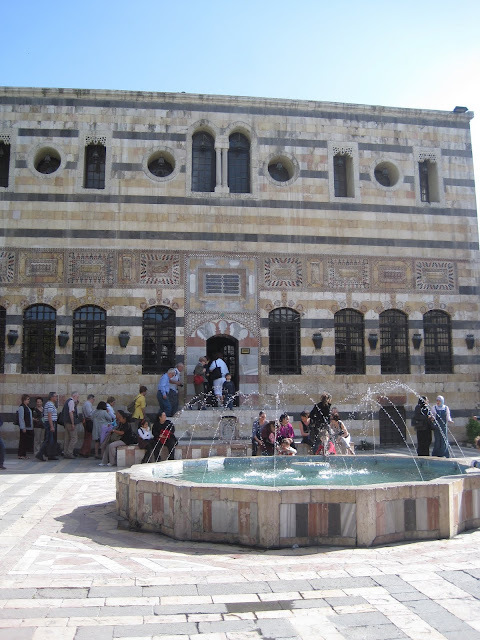 The trip was a lovely introduction, but we'd like to see a lot more of Damascus. 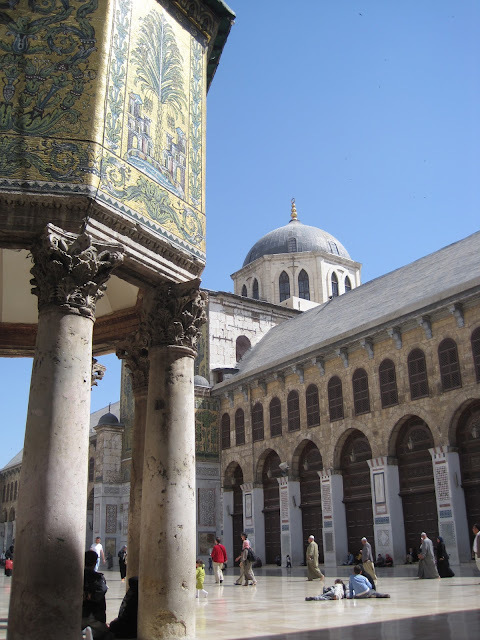 Damascus looks so beautiful - and somehow serene! I could just see myself working in those government buildings and eating my lunch outside. 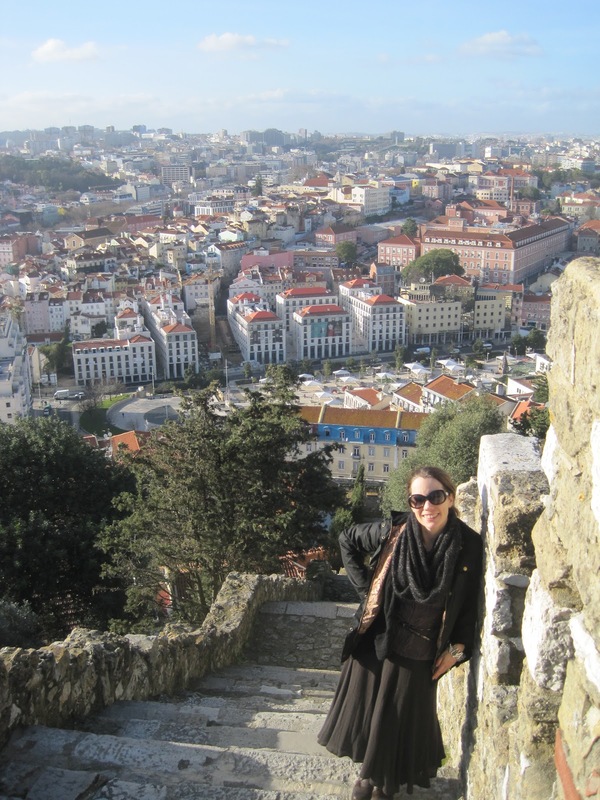 Thanks Anna, It is lovely, though not too serene, it's a busy bustling city, lots of people and lots of noise. I'm glad that you arrived at my Cordoba blog post by happenstance. Your comments were greatly appreciated, as was the opportunity to visit your blog. Both your commentary and photos are excellent. I've bookmarked "So Much More to See" and look forward to returning to read past and future posts. Happy travels! Thanks Kerry and Tina, I appreciate the encouragement!